Many types of cameras exist, both for video and imagery. At California Electronics Recycler we have seen all types of cameras be recycled, ranging from point & shoot to full movie production cameras. If you have a camera that is not being used anymore we urge you to recycle it to keep it out of our landfills. 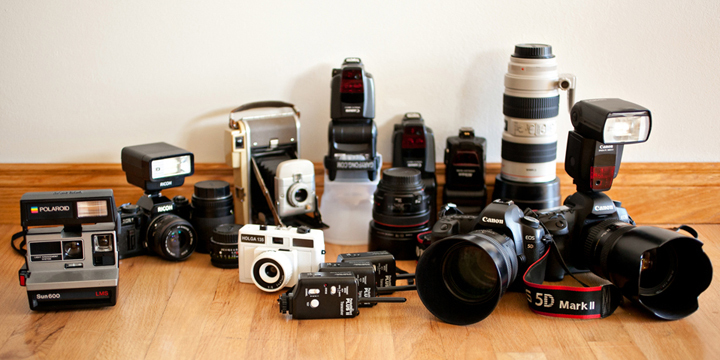 Why Should You Recycle Your Cameras? Cameras contain many reusable materials such as gold and platinum in processors, aluminum in the casings, and copper in the wires. Aside from the precious metals you can also find Lead in the solder, lithium and cadmium in rechargeable batteries and more that should not be left in our landfills. When they are not recycled properly they can be harmful to our health and damage the air, water, and the soil. By recycling electronics manufacturers can reuse the materials and save money on mining for more raw materials. There are a few ways to recycle cameras. Recycling cameras can involve donating them to a cause or to someone who could use one. Cameras can often be of high value and resold to keep them out of landfills and recover some of the costs. They can also be broken down into raw materials to be reused for future products. Recycling involves preventative techniques to keep these electronics and harmful materials out of our landfills. If you have cameras that need to be recycled call California Electronics Recycle at (800) 282-3927 today. You may be eligible for a free business pickup.